I was a columnist for our local paper when I wrote this piece on a Tuesday afternoon in November 2006 while in Arkansas visiting my husband’s family. 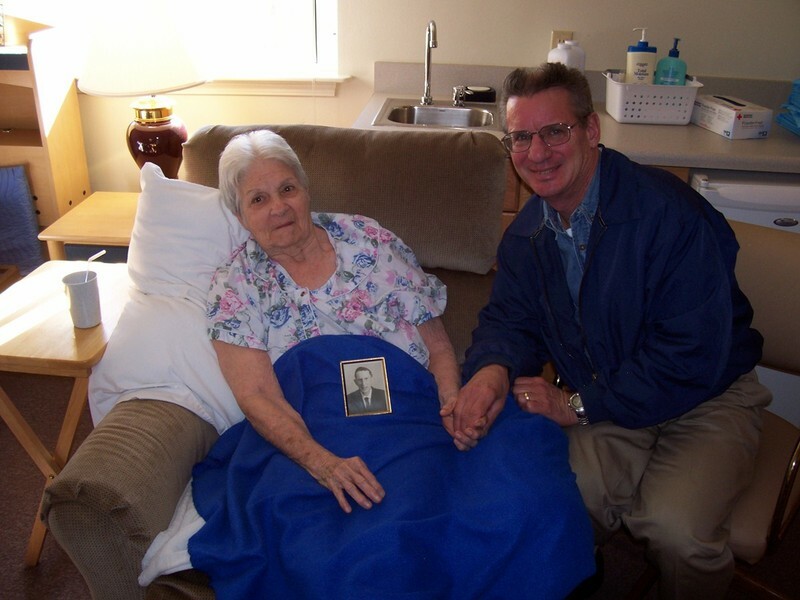 It is about my mother-in-law, Lillian, who is, right now, in her last days of life. She is gravely ill with gall stones, has stopped eating, and her small, frail body is shutting down, piece by piece. My husband is on his way to Arkansas to say goodbye, but she won’t know he’s there. She hasn’t recognized him for five years. Damn, damn, damn Alzheimer’s disease. My mother-in-law is Lillian Bering. She doesn’t know that, though. She doesn’t know she lives in Arkansas, nestled in the hills of the Ozarks in the town that spawned Wal-Mart. She doesn’t know that her home is a room with a bed, a chair and a dresser. She doesn’t know her sons, her daughters, what time it is, what day it is, who is president, that she loved a man named Charles, that she once lived in New Orleans or that she has beautiful thick gray hair. She knows she likes cranberry juice, but only in the moment she tastes it. She knows she likes gerbera daisies, but only when she sees them. Lil can’t feed herself or use the bathroom, but she knows cold and warm, she feels the sunshine and breeze through her window, she’s able to scratch her nose and cheek when they itch, and she knows when she’s comfortable and when she doesn’t want to be moved. She sits in her chair most days with no stimuli – no television or radio. Just muffled voices beyond her nursing home room door. Her memories disappear as quickly as they are formed, but her eyes express what her weakened voice can’t verbalize well anymore. She has Alzheimer’s, but she’s still alive. Larry tried to tell himself years ago that he said goodbye to his mother when she was no longer able to recognize him, but he realized on this beautiful Tuesday afternoon that you can’t say final goodbyes to the living. When we walked in the room, Lil had slid deep into the side of her recliner, her head lying just above the arm rest. My sister-in-law and Larry lifted her upright, straightened her pillow, and covered her with a blue Sam’s Club fleece. She smiled and her eyes brightened when she saw us in her room. Larry sat next to her and held her hand. She gripped it tightly, every once in awhile holding it to her cheek. As I watched her, I thought about the instinctive nature of our tasks as mothers. We can be deeply involved in something – a book, a sermon, work – and yet if our children come near us, we are aware of their presence without being fully conscious of it, and we reach out and touch them and let them know they are always a part of us whether we are fully in their presence or not. Today, Lillian was Larry’s mother, not consciously aware of who he was, but somehow aware, somewhere in her mind, of his being there with her. Lillian surprised us with a clear, precise recollection of a detail, a completely lucid moment that lasted five seconds at best, but it was five seconds in which our guilt for being healthy as she suffered with Alzheimer’s was sidelined, and she was a part of our collective conscience, a participant in our conversation. When Lillian was a little girl during the Great Depression, her father killed himself. Her mother’s brother, fondly known as simply Uncle, moved in with the family and raised Lillian and her siblings as his own. She has a photo of Uncle in her room and when Larry showed it to her, she said, “He never had a girl.” My sister-in-law, Larry and I looked at each other and smiled. She was right. Uncle had a few girlfriends, but he remained single all his 94 years. It’s hard for us with working, thinking minds to comprehend having no real awareness of time, people, things, or consciousness in general. And so we try to fill in gaps for our loved ones with Alzheimer’s that probably don’t need to be filled, but we fill them anyway to ease our fear that perhaps another lucid moment might come about and they might, for one split second, realize that there is nothing or no one nearby. No music playing. No television on. Just a bare wall in front of them. It is in that fear and feeling of total helplessness that Larry decided his mother needed flowers, if for no other reason than he’d feel better that she has colors to look at instead of a dresser with little more than a photo of Uncle and a mirror reflecting her hospital bed. We will buy her gerbera daisies before visiting her again tomorrow. “It was nice to connect with my mom again,” he told me tonight. This entry was posted in Uncategorized on July 12, 2009 by Lynn Haraldson.